Coffee: You Name It, It's Yours! Well, it seems that the cafe at The Forum has finally caught up with the rest of the Starbucks chain and have started the annoying practice of demanding your identity to label your cup with. To set the record straight, the cafe itself is not actually a Starbucks. It is run by Food Hertfordshire, a wholly owned subsidiary of the university, but they make use of Starbucks' mugs, cups, coffees and advertising, presumably to justify the prices. My guess is that as part of this agreement, they have to follow certain guidelines. From a business perspective, I can understand the desire to get the right drink to the right customer, but having such a common name myself, I would be more likely to get the right drink if they just named it. Assuming they get it right in the first place. However, my personal view is: why should I give them my name? Especially when not a single member of staff is sporting a name badge (at least, tonight they weren't). If you want to know my name, at least have the decency to tell me yours first! Maybe I'm just being a typical Brit, wanting to be left to my daily routines in privacy (he says, blogging the experience - a bit of irony, anyone?!). That said, the typical Brit is pretty good at picking up on corporate BS, perhaps out of an innate distrust of businesses, so the enforced friendliness is obviously a facade which immediately puts you on your guard. If you want to know how it is done properly, visit The Coffee Shop at the Presence store in Watford. Whilst the coffee is pretty average and the atmosphere may not be to everyone's liking, the staff there are naturally friendly and come across as having a genuine interest in you ... and there is plenty of frilly tat to buy annoying aunts, if needs be. Tonight, I was served by the manager (who shall remain nameless, though only by virtue of the fact that she is apparently nameless anyway). When she asked for my name, I was caught a tad unawares as I wasn't expecting to be asked, especially as I was the only person in the queue, which I politely pointed out in an effort not to tell. However, she would not be swayed and stood by her ground in an effort to show a good example to her staff. Then, to ease the process for me, she said I could make up a name, such as "Bob" if I wanted and promptly labelled the cup as such. Sorted! So, we can invent completely random names ... not entirely sure why I didn't think I could do that in the first place, though it could be something to do with an inability to lie (at least, not convincingly)! To be honest, I have a really hard time trying to come up with names anyway when setting up new accounts on some new-fangled internet service: trying to create something completely unique seems to be insanely impossible. That said, there are perhaps a few names that come to mind, although I'm not entirely sure the staff will get the humour, the cult/geek references or that some of these names are actually real! 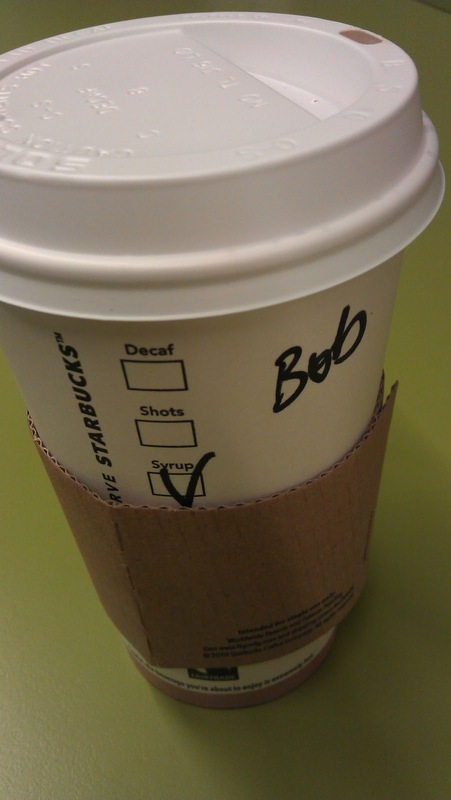 Of course, I could baffle them completely and use "the silliest name in all the galaxy" (thanks Steve Oedekerk), and a name that inspired my Facebook username ... Oobi-do Scoobi-doobi Banoobi ... let's see you try writing that one on your cups!